The viewing/picnic area on the way to the summit of Mount Kobo. However, hiking is not cute. Mount Tanzawa is a two-day hike. The first day is 7 km straight up and then on day two we head 10 km peaking just over 5,000 feet (remember, Japan starts at 0 feet above sea level). This is going to be a mountain-man, whiskey-in-your-veins kind of hiking trip. Hiking means something different to Japanese. They call it “hikingu,” and they consider it to be an easy stroll along a paved trail that might have some flowers and trees and then they have a picnic and then maybe take a cable car back down. There is even a cultural phenomena called “yamagarru” (mountain girls). These college-aged girls can be found on every hiking trail, dressed from head to toe in brightly colored, brand new hiking gear. Very cute. 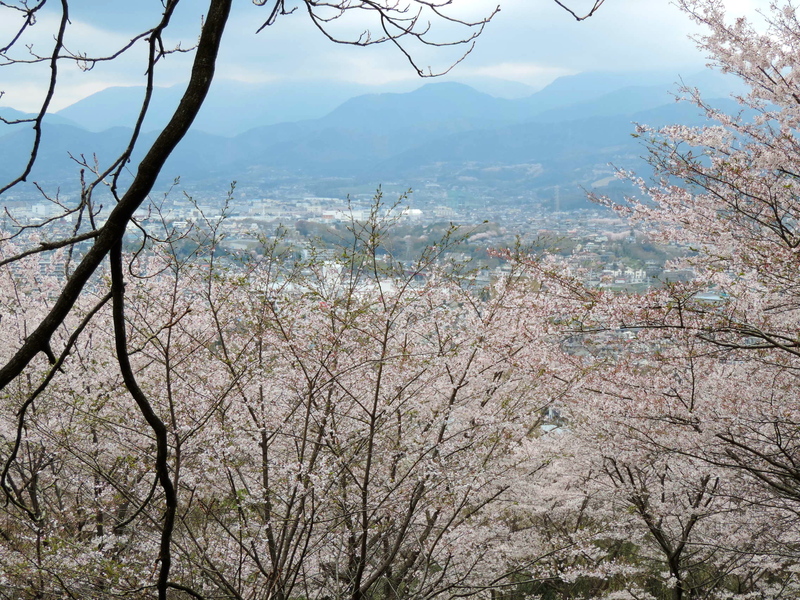 A mountaineering expert I interviewed for a past story recommended Mount Kobo as an easy, family-friendly day hike during hanami season (cherry blossom season). 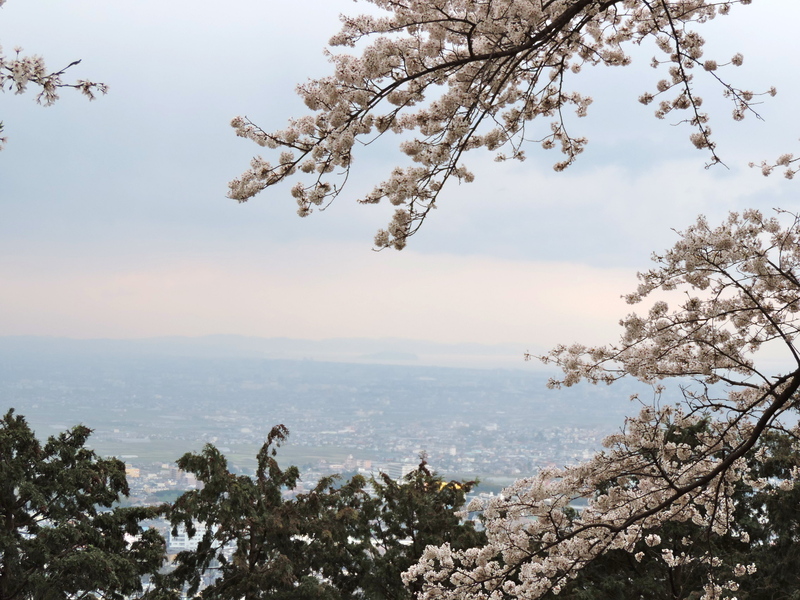 Having recommended this hike to readers as a nice spot to view the cherry blossoms, I figured I better check the place out myself (even though the article was already in print). Overlooking the city of Hadano. We took the Odakyu line towards Odawara from Shinjuku and the train ride to Hadano Station was just over an hour. We arrived at 11 a.m. and our friend Makana got there six minutes later. The English maps at the information center were pretty rudimentary. They showed the train station, and the mountaintop, and there was a squiggly line that led to the summit, not bothering to notate any landmarks in between. So using the google maps app we left the north exit of the station, went straight until we hit a dead end intersection and then took a right, which led us to the base of the mountain. The walk through town was the longest portion of the hike. About five minutes into the hike up the hillside we found a parking lot that was surprisingly busy. The sky was overcast that day and there was a light sprinkling of rain. 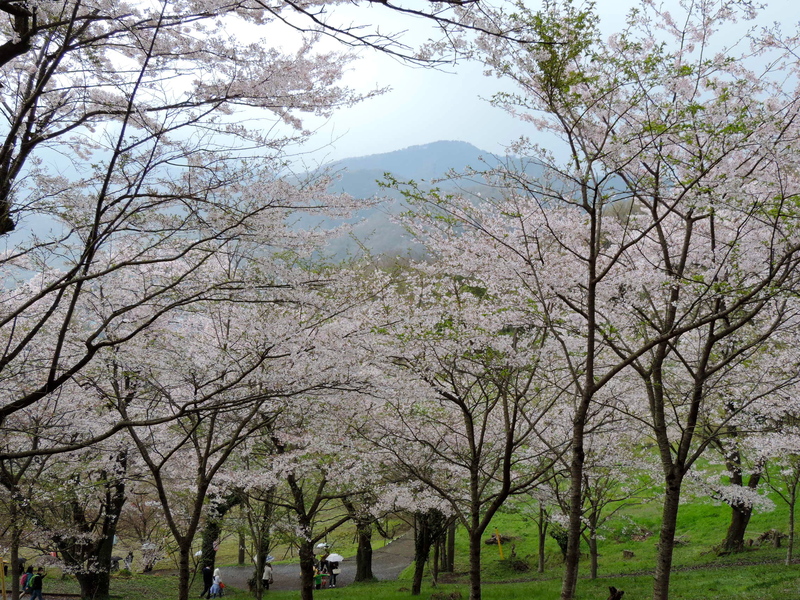 Being the peak of hanami season, the forecast of thunderheads didn’t keep everybody away, even though three of our Japanese friends had backed out of the trip. Lisa told me that in school they are taught that thunderstorms are extremely dangerous on mountains and should be avoided at all cost. Lisa’s friend had called us at 6:30 a.m. warning us we shouldn’t risk it. However, Mount Kobo is a mere 235 meters (771 feet) high, and barely qualifies as a large hill. If there was a thunderstorm, we could be back in town before the first bolt of lightning hit the ground. From the parking lot, it was a fairly steep, 15 minute climb to the viewing spot slash picnic area. There was a clearing about the size of a football field and the circumference was lined with picnickers. There was also a pretty two-story gazebo that was packed with people trying to protect themselves from the light rain. We found the one flat, open spot on the rim of the plateau and set up our little “hobo” camp, as Makana called it. 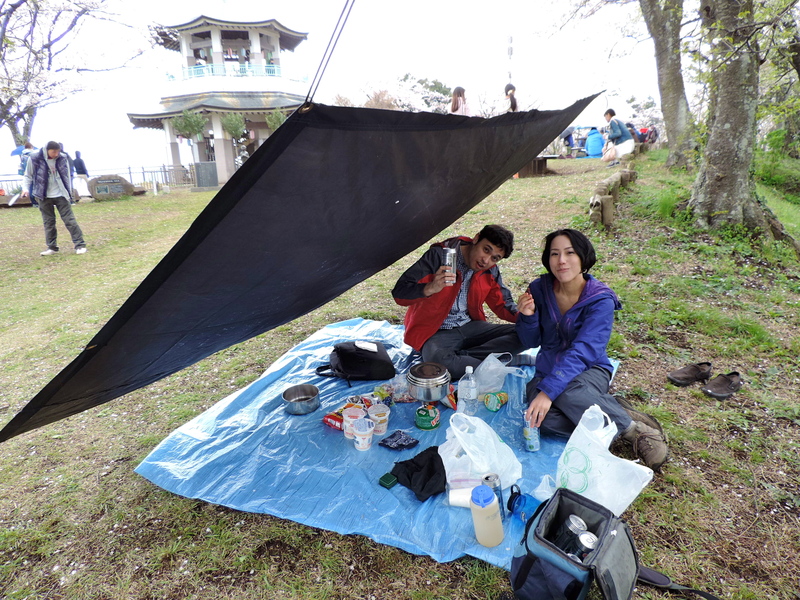 We had bought a 100 yen ($1) blue picnic tarp and laid it on the ground. I had also brought up my rain fly. I tied two corners from the branches of the cherry tree and staked the other two corners down, so it acted as a lean-to. 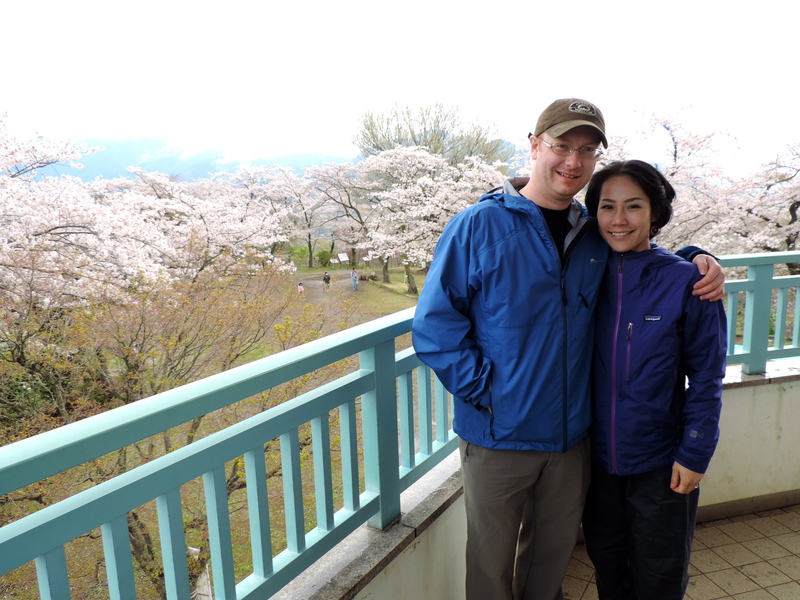 We kind of had a view overlooking the mountainside and we also had privacy and protection from the rain. There was a group of girls next to us dressed in their Sunday’s best huddled under umbrellas. They didn’t look like they were feeling very kawaii. I had brought along my camp stove and heated up some water for Cup o Noodle. I also lugged up my REI cooler full of tall boy cans of beer and Chu-Hi. We proceeded to drink and eat ramen under our shelter. By the time we finished most of the other people had cleared out, as did the rain. The second story of the gazebo. The sun popped out and we had some blue skies and we were able to climb to the second story of the gazebo and enjoy the view on our own. We tore down our little camp and headed to the summit of Mount Kobo. It was an easy 10-minute hike along a paved sidewalk. There were even a couple of yakisoba vendors along the way, and flush toilets. 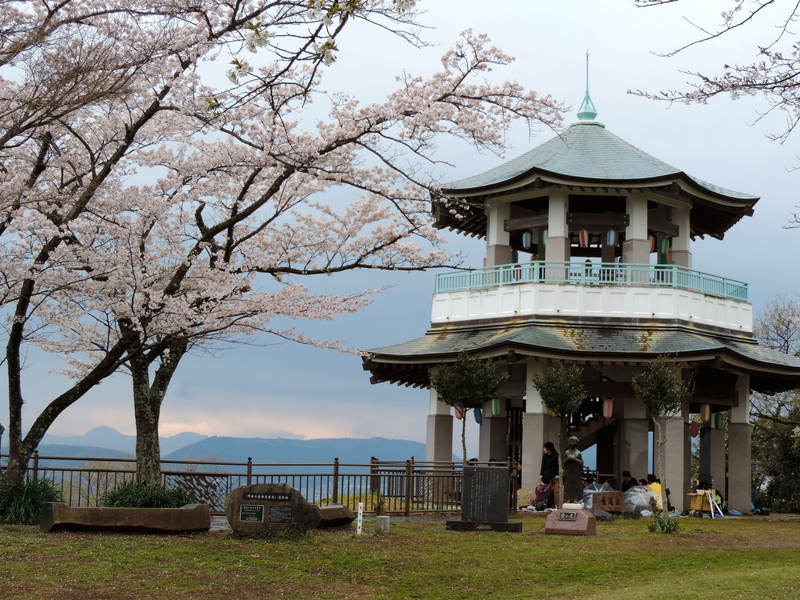 There was a shrine at the top of the mountain and we had it all to ourselves. 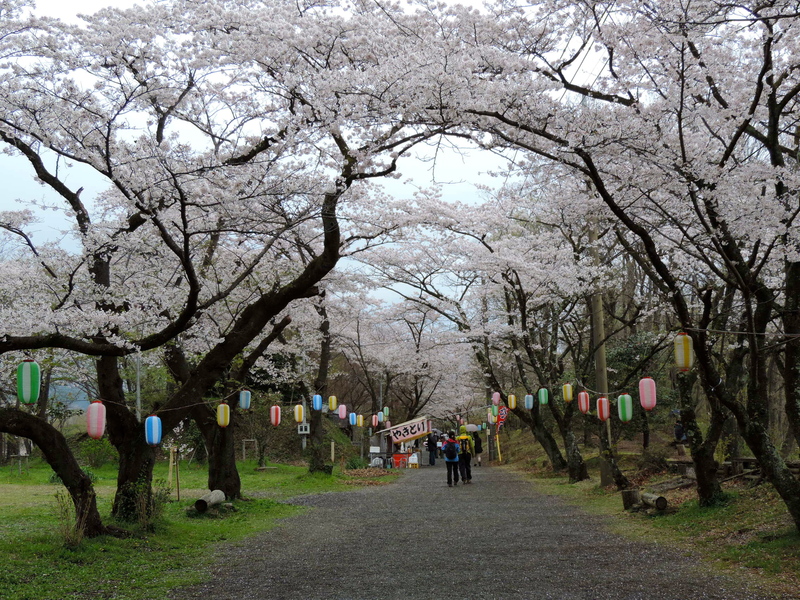 There are over 5,000 cherry trees in the Hadano area and normally during hanami season it is jam-packed, elbow-to-elbow with visitors. The bad weather report turned out to be a bit of a blessing. The walk to the summit. Even though the view was mostly obscured with clouds, we were able to escape Tokyo for the day and enjoy the peace and quiet of the wilderness on our lonesome, which is quite rare on the Japanese hiking trails. 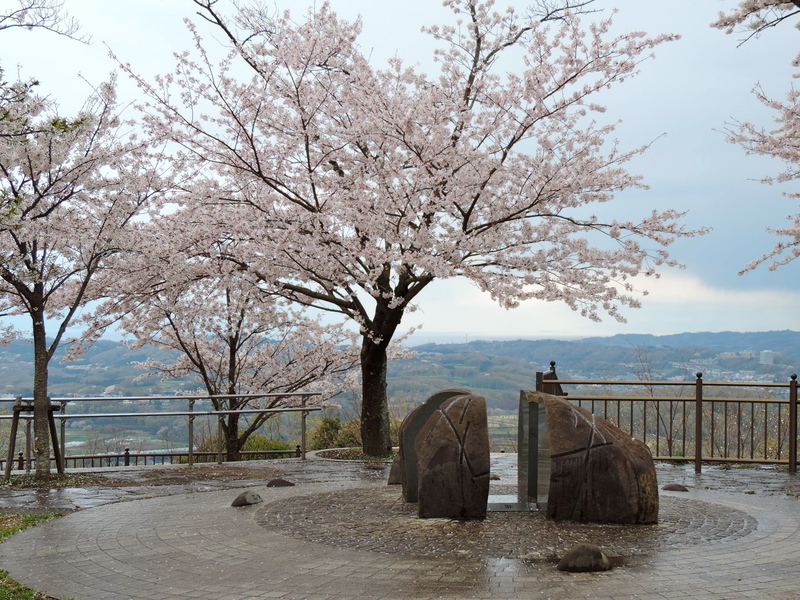 On a clear day you should be able to see Mount Fuji from the picnic area and from the summit you can view Tokyo Bay. We caught a glimpse of what we thought was Enoshima Island, but spent our time at the top polishing off the rest of our alcohol. 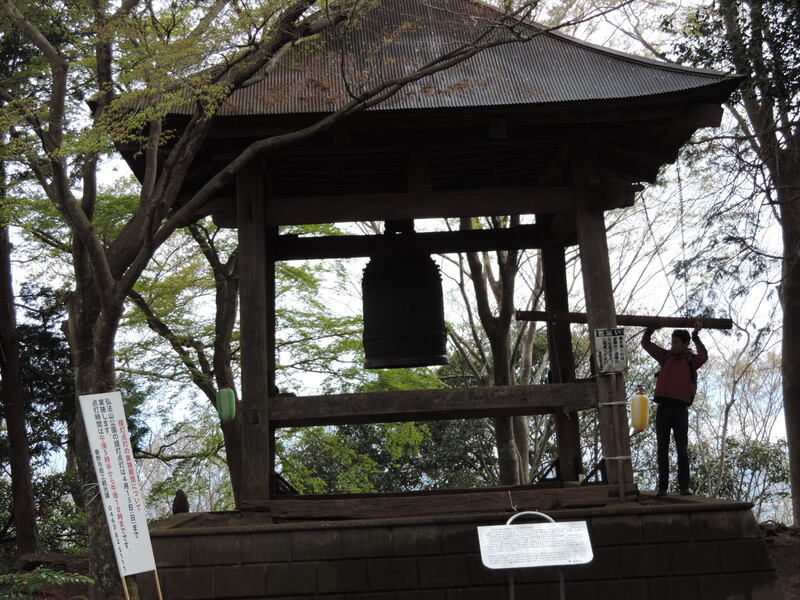 The bell at the summit of Mount Kobo. Instead of returning from whence we came, we headed down the other side of the mountain for a 4.3 km hike to Tsurumakionsen Station. There was a nice, big onsen with facilities available for hikers to clean off their boots and store their gear. After a relaxing bath and a cold beer we asked directions to the nearest yakiniku restaurant and enjoyed an assortment of grilled meats. A nice end to a nice day. Mount Kobo is an excellent hike for beginners and families. If somebody having fun, or the weather turns, you can return to civilization quickly. If you want to spend a little more time in the outdoors, you can extend your hike as well. If you’re looking for excitement and adventure, this hike isn’t for you. If you want a nice, relaxing visit to the mountains, then make your way to Mount Kobo. Is that Enoshima Island in the distance?